De Stewart learned a lot at his mother’s apron strings but had the feeling there could be more to flavorings than just salt, pepper, and lard. Later, De went on to learn all he could about herbs and spices. Twice in his career, he found himself working for Col. Sanders, the Kentucky Fried Chicken founder. They even went to the same church. In Northern Kentucky, when De had a cable cooking show, he was known as the “Businessman Chef.” He was a founder of the Northern Kentucky E-Zone (a technology incubator), served on the Northern Kentucky Chamber of Commerce Board of Directors and the Executive Committee for several years, and served on the board and was chair for two years on the Workforce Investment Board (covering an eight county region). 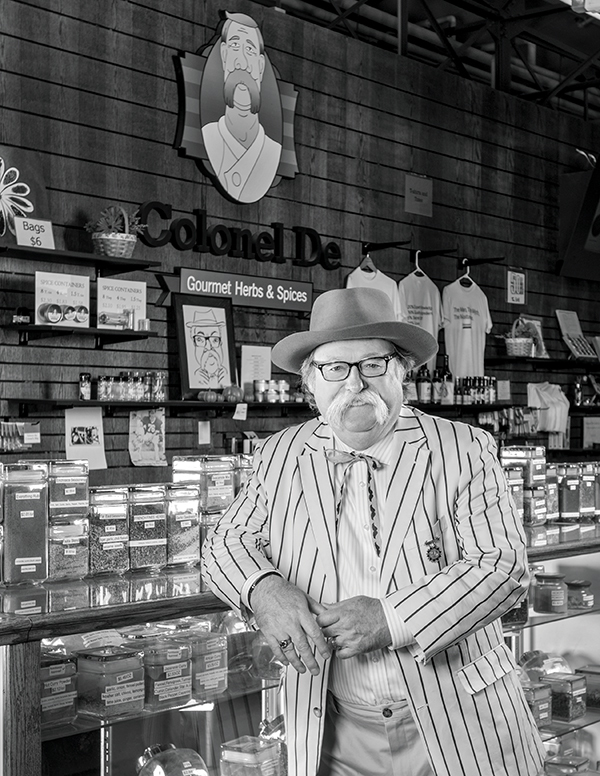 Now with stores in Historic Findlay Market, Jungle Jim’s at Eastgate, The Friendly Market, and one coming soon to Ft. Thomas, De is simply known as “The Colonel.” Proud to be a Kentucky Colonel, he really doesn’t mind. The store boasts more than 500 herbs, spices, and blends. Colonel De even provides consulting and produces custom blends for more than 50 chefs and/or restaurants.